Inspired By True Events - Yes, Yont is addressing a dead writer. Yes, Yont is addressing a dead writer. 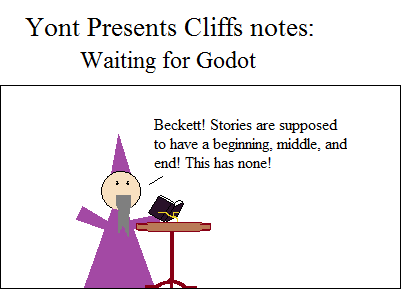 Waiting for Godot makes no sense whatsoever. It’s short, which is good, because the two acts in the play are extremely hard to follow. But you know who can explain it better than me? Alistair Cookie.